Yarn Type Classic and sophisticated in every sense. Soft and sensuous, reflecting the quality and luxury of it’s fibres. 70% Lambswool, 26% Kid Mohair, 4% Nylon. A collection 8 handknit designs by Quail Studio. From cardigans to sweaters, this collections features quality and timeless designs with a classic look. 8 cosy hand knit designs to compliment your style. With shawls, scarves, snoods and wraps to accessorize your winter wardrobe. Whether it be elegant shawls or chunky wraps these designs will see you through the season and accessorize your outfit choice perfectly. 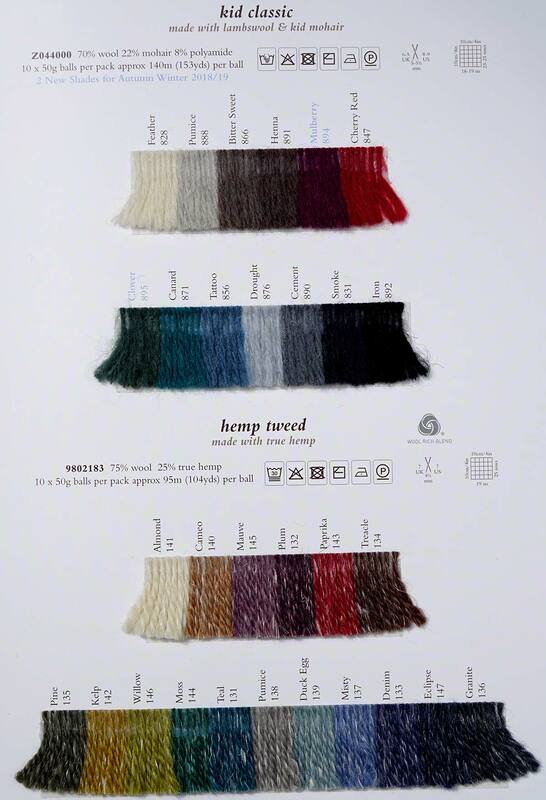 9 designs for women with options using Hemp Tweed & Kid Classic. Designed by Amy Herzog. A collection of six fifties inspired patterns designed by Kim Hargreaves.Designs include a fine knit striped sweater, crochet square shawl and chunky roll neck sweater. You can purchase the patterns individually at £3 each, or buy all six patterns as an entire collection for £9. Autumn/Winter 2012. Studio 28 is inspired by the 1960's 'Mod' look, this collection features strong graphic patterns and bold stripes. 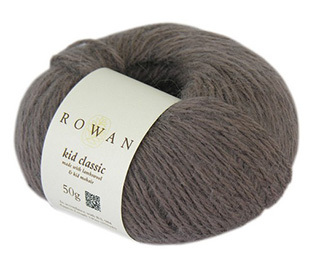 The designs predominantly feature Rowan Kid Classic yarn with the addition of Kidsilk Haze to some designs to emphasize the trend for thick and thin textures. This alternative Christmas Advent calendar can be made from oddments of yarn. Jemma Weston has used Kid Classic but any other yarn from your stash, that is suitable for felting, can be used as a substitute. Knit this ladies chunky poncho, designed by Martin Storey using our lovely soft spun yarn Kid Classic (lambswool and kid mohair), this poncho has a cable and moss stitch pattern, chunky rib collar and a dipped hem. Originally featured in the Classic Alpine brochure, this pattern is now available as a free download. Knit this pretty ladies poncho designed by Marie Wallin using our lovely soft spun yarn Kid Classic (lambswool and mohair), this poncho has an all over cable and bobble design and ribbed turn down collar. Originally featured in Rowan Knitting & Crochet Magazine 46, now available as a free pattern to download. Knit these fun festive Christmas tree decorations. Designed by Anna Nikipirowicz using Kid Classic, a perfect blend of lambswool and kid mohair, these will decorations will brighten up any Christmas tree. Knit these accessory leg warmers, available as a free pattern to download. Designed by Heike Kruessel using the lovely soft spun yarn Kid Classic (lambswool and kid mohair), these cable legwarmers can also be worn as arm warmers.